The Turkish element in Central Asia, though it must have been numerous, does not cut any figure in history, which is filled with the chronicles of Arab and Persian dynasties. But in the l0th century, Turkish adventurers founded the dynasty of Ghaznevids at Ghazni, and there was a Uighur kingdom in the east comprising Kashgar and Khotan. Boghra Khan, the ruler of this kingdom, was converted to Islam at the end of the 10th century, and it continued under various branches of Uighurs until 1120. It will be seen that great confusion exists with regard to these Khans. There are long lists of Ilik Khans; but it is hard to reconcile any two accounts, so much do the names and dates differ. The name of Kara-Khanides was first suggested by Grigorieff for this dynasty, after Satuk Kara Khan, who was the first of its kings to embrace Islam. The title is more convenient than the others by which this dynasty has been known, such as Uighurs, Ilek-khans, and Ilkhans. This Turkish state extended from Kashghar to the Sea of Aral. The relations of this state with its southern neighbours were at first of a peaceful and even friendly character; but when the nomads perceived that Iranian authority was on the wane they began to cast longing eyes across the Jaxartes. They probably belonged to the tribe of Uighur, which had been the first to separate from the main body of the Turkish race and settle down in a home on the slopes of the Tien-shan. During the Samani rule Islam was first introduced among the Uyghur of Kashghar. Here, as in the Oxus valley, it met a determined opposition, and, notwithstanding the conversion of Satoc Bughra Khan, the hereditary chief of Kashghar, and his zeal in the cause of its propagation, the doctrine and law was not enforced in the country until Khutan - the ancient stronghold of Budhism - was finally subjugated. This was after a warfare of nearly twenty-five years, during which the flower of Persian chivalry withered on an unknown waste, and a host of Arab martyrs sanctified the soil with their blood, and earned for themselves a lasting memorial in the endless calendar of Muhammadan saints. On the decline of the Samani dynasty after a rule of nearly a hundred and fifty years - during which the Persian literature suppressed by the Arabs was revived, and the religion planted by them was established according to the orthodox Sunni ordinance in triumph over the Shid heresy propagated by the false prophet Muccann'a - the Bughra Khan family, whose ruling chief was called Iylik Khan and had his capital at Kashghar, rose to power. Baytash Musa Khan 955 ? The first of the Ulghur Khans of Turkestan who plays any great part in Mohammedan history is Boghra Khan, whose capital was Balasaghun, and who ruled over Kashghar (called Urdu Kend), Khotan, Karakorum, Taras, and Farab (Otrar). It was under the reign of Sultan Satoc Baghra Khan Ghazi that Islam was first introduced into the country, he himself having become an early convert at the hands of Abu Nasr, one of the conquering Samani princes of Bukhara. He spent his life in wars of conversion. He was contemporaneous with Nuh III, seventh of the Samanide line, whose reign was characterised by the utmost confusion and anarchy. Two of Nuh's most powerful nobles - Abu 'All Simjur, governor of Khorasan, and Fa'ik, governor of Herat, whose insubordination had received severe but well merited punishment at the hands of their master - made treacherous overtures to Boghra Khan, and invited him to attack Nuh. The invitation was accepted with alacrity by the Ulghur prince, who at once set out for Samarkand, which was delivered over to him by the faithless Fa'ik, whom Nuh had intrusted with its defence. The feeble representative of the Samanides, thus betrayed, fled from his capital, which Boghra Khan shortly after entered in triumph, and became practically master of Transoxiana. But the climate of Bokhara did not suit him. He set out for his home, when death overtook him ere he had gone many stages, A.H. 383 (993). Meanwhile Nuh re-entered Bokhara and regained possession of his dominion. But though he was heartily welcomed by the people he did not feel secure from the treachery of his nobles, and on this account he invited the great Sabuktagin, in the year A.H. 384 (994), to come to his aid. Sabuktagin immediately hastened over the mountain passes at the head of 20,000 men, and, crossing the Oxus, joined Nuh at Kesh. Seconded by his son Mahmud, he gained three victories over the rebel lieutenants at Herat, Nlshapur, and finally at Tus. Fa'ik had in the meanwhile fled to Ilik Khan, the son and successor of Boghra Khan, and Bokhara was threatened with a second Ulghur invasion. In reply to the menace, Sabuktagin, who had quarrelled with Nuh, concluded a peace with Ilik, and appointed the rebellious Fa'ik governor of Samarkand. In A.H. 387 (997) both Sabuktagin and Nuh died, and were respectively succeeded by the valorous and talented Mahmud, and by Mansur II. who exhibited qualities precisely the reverse. Transoxiana fell into the power of Ilik Khan, while Mahmud of Ghazna gained possession of Khorasan. Turks had long held high office in the states of Islam in Central Asia, as well as in Baghdad and in Egypt, where they had founded a powerful dynasty. It was, therefore, no great change for them to find themselves, as a nation, masters of the extensive kingdom of which Bokhara was the capital. Mansur II., after a reign of less than two years, was deprived of sight by one of his discontented courtiers named Bektuzun ; and'Abd el-Melik II., a mere child, was set up in his stead. All power was now concentrated in the hands of Fa'ik and Bektuzun. When news of these events reached Ilik Khan in Kashghar he sent a message to 'Abd el-Melik to the effect that he would speedily take measures to protect him. Bektuzun immediately set out to oppose Ilik Khan, but he was unsuccessful, and in A.H. 389 (999) Ilik Khan entered Bokhara. Instead, however, of helping the young prince, he cast him into prison, where he soon afterwards died. When, in A.H. 389 (999), Ilik Khan [ie, Abu-l-Husayn Nasr I] wrested Transoxiana from the Samanides, their capital was removed to Bokhara. In A.H. 398 (1007) they attempted to establish themselves south of the Oxus, but were driven back by Mahmud of Ghazna, and henceforward their territory was restricted to Transoxiana, Kashghar, and Eastern Tartary. About the beginning of the tenth century a prince of the hereditary house of the Khans of Kashghar, named Satuk Boghra Khan [born in A.H. 333 (944)], became the first convert in that country to Islam, which he proceeded to force upon his subjects at the point of the sword, in the face of a determined and protracted opposition which prevented its spread beyond the limits of his own territory. It was only on the downfall of the Samanides that the creed of Mohammed, through proselytising zeal - of Mahmud in the direction of Hindustan, and of Ilik Khan in that of Turkestan - received a fresh impetus, and spread north, south, and east with a rapidity only equalled by the violence employed by its propagators. According to Narshakhi, Ilik Khan died in A.H. 403 (1012), and was succeeded by his brother Toghan Khan, who, a few days after his accession, was attacked by what appeared to be an incurable malady. The Sultans of Khitay and Khotan, thinking to take advantage of his helpless state, advanced with an enormous host to attack his dominions.1 But, on hearing of the approaching invasion, the Khan miraculously recovered his health and forthwith set out to oppose his enemies. We are told that they retreated without striking a blow as soon as they learnt that their quarry had regained his strength, but were hotly pursued and harassed by the Khan for three months. Toghan Khan died in A.H. 408 (1018). He is spoken of in terms of the highest praise, both on accoimt of his piety and his learning. His successor was Arslan Khan, who, however, was unable to preserve the integrity of his kingdom. Coming into conflict with Sultan Mahmud, he was defeated and killed in the year A.H. 410 (1020). Kadir2 Khan, who now ascended the throne at Samarkand, is said to have brought the whole of Kashghar and Khotan under his subjection. He died in A.H. 423 (1031), and was succeeded by his son Arslan Khan. During his reign he received a deputation from some Turks of Tibet, who, hearing of his justice and clemency, asked permission to settle in the neighborhood of Balasaghun. He granted their request, and when they arrived he tried to compel their acceptance of Islam. This they refused, but as they were otherwise loyal and obedient he gave way and allowed them to remain in a state of heathenism. Arslan Khan was overthrown in A.H. 425 (1033) by his brother Boghra Khan, during whose reign the immigrant Turks embraced Islam (A.H. 432). He died by poison in A.H. 439 (1047), and was succeeded by his son Ibrahim-the last chief of the house of Boghra Khan. 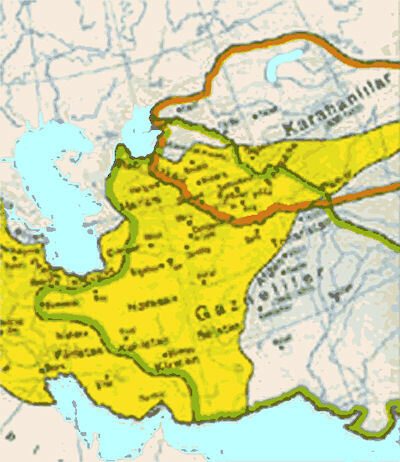 The kingdom of Kashghar seems shortly afterwards to have fallen into the hands of another branch of the Eastern Ulghurs, called by Narshakhi the Tufghaj, the first of whose representatives, Ibrahim, was killed in battle against Alp Arslan, the Seljuk, in A.H. 472 (1079), and was succeeded by his brother Khidhr Khan.4 He apparently died in the same year, when his son Ahmed Khan came to the throne. The latter, in A.H. 482(1089), was attacked and defeated by Melik Shah, and sent prisoner to Isfahan; but soon afterwards he was reinstated as governor of Transoxiana. In 488 he was condemned to death by the mullas or doctors of Samarkand, on the ground that he professed heretical tenets acquired during his residence in Persian 'Irak. After him Mas'ud Khan5 reigned for a short period, and was succeeded by Kadir Khan, who in A.H. 495 (1101) perished in an insurrection fomented by him against Sanjar, the then governor of Khorasan. Iylik Khan was dispossessed of his western conquests by the Seljuk Tatar under Sultan Sanjar; and dissensions breaking out in the Bughra Khan family, the Uyghur, divided among themselves, soon succumbed to the Cara Khitay, a Mughol or Mongol horde, who were advancing from the direction of Ila in the early part of the twelfth century. Gorkhan or "Sovereign Lord" - the title of the leader of this wandering horde of Chinese outcasts - profiting by the asylum granted to his Budhist following on the Uyghur borders, took advantage of their internal dissensions to seize the country for himself, and very quickly extended his conquests up to Khiva. The Cara Khitay rule, after enduring for eighty-five years, was suddenly overthrown by the treachery of Koshluk Khan, who plotted with Cutubuddin Muhammad Khwarizm Shah for the division of the Gorkhan Empire between them. Kashghar reached the height of its prosperity as the capital of the Uyghur kingdom under the princes of the lylik dynasty. In the time of those kings - the tenth and eleventh centuries - the suburbs of Kashghar, it is said, extended up to the settlement of Artosh, twenty miles to the north at the point of divergence of the caravan routes, by the passes on the west to Khocaud, and on the north to Almati. At that time Artosh itself was a flourishing market town, and the residence of the Baghra Khan branch of the royal family, the hereditary princes of the country, and for many centuries the rulers of Kashghar.